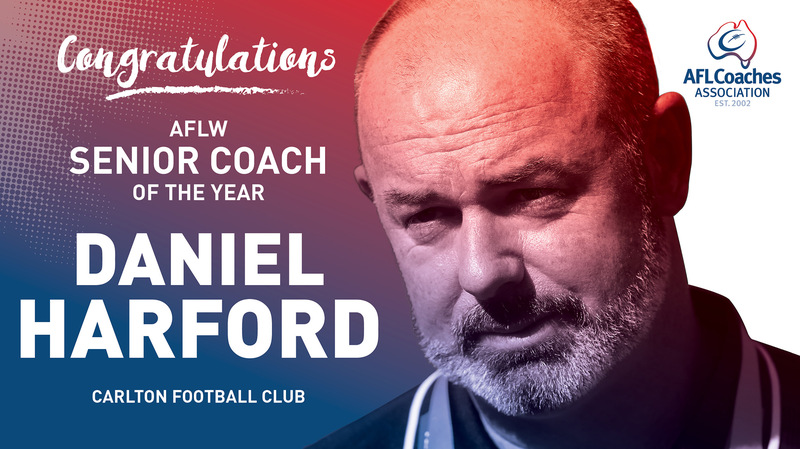 Carlton Blues AFLW senior coach, Daniel Harford has been voted by his peers as the inaugural AFL Coaches Association AFLW Senior Coach of the Year for 2019. In his first year as senior coach, Harford has had a huge impact at the Blues, resulting in a Grand Final appearance this weekend, only 12 months after the team finished with the wooden spoon. Harford edged out fellow Grand Final coach Matthew Clarke (Adelaide Crows) and Fremantle’s Trent Cooper, who both had fantastic seasons, to be deemed to be the best performed senior coach throughout the 2019 AFLW season, up to and including the preliminary finals. The award, voted by all AFLW senior coaches, has regard for current season's performance, available resources, player talent and team management. AFL Coaches Association CEO, Mark Brayshaw, hailed Harford’s 2019 coaching performance and his ability to turn the tide at the Blues after last season. “It’s a fantastic achievement for Daniel in his first year as a senior coach. It’s no surprise that the game knowledge he has injected at the Blues, combined with his energy and enthusiasm have reaped rewards this season. We congratulate Daniel on winning the inaugural AFL Coaches Association AFLW Senior Coach of the Year,” said Brayshaw.